Perfect for greeting cards, report covers, rubber-stamping, flyers, and more! White heavyweight 65 lb. card stock. 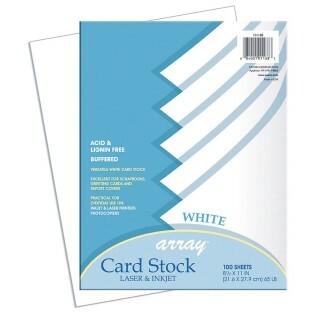 Perfect for greeting cards, postcard, report covers, rubber-stamping, memory books, flyers, announcements, and more! Acid & Lignin free, buffered. copier, inkjet, and laser printer compatible. Recyclable. 8-1/2” x 11”. Pack of 100. Made in USA.